Born and raised in Budapest. He worked first as physicist for high temperature measurements with thermoelements and later as a scientist of high temperature process technics in the industry. He is a known expert of the thermoelements and oxygen probes, his scientific thermoelement-book is now in the third edition (6 000 copies). He owns a factory, where he builds and sells one of the best thermoelements worldwide. His patented thermoelements and oxygen probes are based on his discovery of a new thermoelement-law, which happens to be the base for the model of his "Electric Universe". He also is a candidate of the Hungarian Academy of Sciences, since 1991. He is married and has four sons. It is not very difficult to guess, what "hobbies" he has. As you can see on the photo, he has a telescope of a diameter of 360 mm in his own house. He searches for sunspots, flares and loops on every sunny day. ... only the electric force can repulse huge masses in jets, solar wind, eruptions. It also forms matter to filaments. Filaments and jets are in the fifth state of matter which can be by orders more energetic than plasma. The model Electric Universe is a totally new and contradiction-free astrophysics. In plasma-stars the heat motion pushes the light electrons faster outwards than inwards. The much slower ions remain in and near the core. The photon-pressure and the neutrinos also make the core positive and the surface negative. Find out more of the 4th force inside this website and read and download exiting papers or search for other links to similar content websites. The attractive and repulsive forces in microcosm and macrocosm show the elegant simplicity and beautiful symmetry of the Universe. This was not understood in the 20th century. The main problem was, how could the Universe still have e.g. positive matter which should eject another positive matter as the Sun its proton-flares? Yes, positive and negative matter continually neutralize each other. But the sun-like stars continually produce new charged matter, too, e.g. negatively charged wind and proton-flares. They do it via 43 times quicker thermal motion of the plasma-electrons related to that of the protons (Eddington 1925). Therefore, electron-jumps outwards are in average longer than those inwards. In addition to this thermoelement-effect, the solar photons and the solar neutrinos also push outwards the electrons to longer jumps but the ions to shorter ones. The solar surface is charged negatively. Neutron stars, cosmic rays and black holes have more violent electric functions. This is shown in the book and in the homepage of "The Electric Universe". Is there another state of matter which is more energetic than plasma? How can we explain the cosmic rays up to particle energies of 1021electronvolt? Filaments of the solar corona seem to be very hot without clear heating process, why? Why are filaments and jets so very thin - as recently discovered? Why did SOHO not find the solar dynamo (its most important goal)? How many states of matter are theoretically possible? One of the states of matter is the Bose-Einstein condensate. It has zero thermal-energy. We should give the number zero to it (table below); also because of its proximity to the 0K. Its popular name of the "fifth state of matter" is clearly incorrect since heated plasma will never be transformed to this Bose-Einstein condensate. Taking this into consideration, the filaments should belong to "the fifth state of matter". Sparks, electron beams in TV, lightnings, ion jets in the spacecraft Deep Space 1, in accelerator machines like CERN, ions in the future fusion-reactor, solar coronae, flares, jets of young stars, jets at black holes and at neutron stars (electric magnetars) belong to this most energetic state of matter. Solar flare-particles have 1010 eV, those of the hottest plasma (in supernovae) only 105 eV. Filaments are the largest bodies of the Universe. These filaments and jets have an exact circular cross section, can oscillate and are produced electrically from e.g. plasma. Its particles move in only one direction i.e. without the thermal zig-zag. The fifth state of matter is also a non-thermal state! Interestingly, particles in the most energetic state of matter do not emit heat due to their flight along straight lines. These particle-motions in filaments were already named recently: "non-thermal motions". For example, the solar wind has a "non-thermal velocity" of 750km/s which would need a solar surface of 24 million Kelvin. Solar mass ejection of a "non-thermal velocity" of 1500 km/s should have 96 MK. The theoretic category, in which particles move in two dimensions, is impossible, because such bodies cannot exist. They would have zero volume. Plasma particles above 105 eV cannot exist because hypernovae cannot exist. Filament-particles above 1026 eV cannot exist. The largest neutron stars of three sunmasses have only 1026 V. The energy of the particles has an upper limit in all states of matter. Therefore, very probably, the Universe has these six states of matter, not more and not less. Let us first analyze some terrestrial filaments. The electron beam in the TV is a filament of electrons. The three electron guns have a hole of a diameter of 2 mm each. But the electron beam would produce a very blurred white-black picture on the screen with a spot of this diameter (all the three phosphors of the screen would light contemporarily given white light together). Moreover, the projection onto the fare screen would enlarge this spot about 20 times. But in reality, this spot has a diameter of only 0.2 mm due to the attraction among the negative currents in this electron beam. This attraction is much stronger than the very strong electrostatic repulsion among the electrons in the beam. The electrons - injected into the big volume of the screen-valve - do not explode electrostatically and do not fill the whole big volume, but form a thin beam which has a smaller diameter (0.2 mm) than the emitting surface (2 mm). The negative currents in the beam look for the minimal cross section. This is the circular cross section. Similarly, the lightning is also a filament of a circular cross section of a diameter of about 0.1m. Also the lightning has a much smaller diameter than the charged cloud which emits it. The strong electrostatic repulsion among the huge number of electrons is overbalanced by the much stronger attraction among the electric currents. Only the movement of electric charges produces the filament, if the lightning would stop, it would have immediately a very big and exploding volume of a diameter of many kilometers due to the electrostatic repulsion. Each spark - of the e.g. test-plant for electric insulators - is an electric filament of a circular cross section. Stronger currents cause thinner sparks due to the stronger attraction among the negative electric charges in motion. An ion-beam in CERN is a positive filament. The ions do not explode electrostatically, they remain in a narrow beam of a circular cross section. This ion-beam has no recombination-light because no electrons are available. Fig. 2 shows post flare loops of the Sun from a movie taken in the light of hydrogen alpha. ( A very detailed explanation was shown by Koertvelyessy 1999 April). The active areas are white due to their strong recombination-light. Note that these active areas are round, nearly circular - not long filaments of a dynamo. They emit the loops of much smaller diameter and weaker intensity in the perpendicular direction to the surface. These observations are inconsistent with the suspposition of a solar dynamo which should somehow produce magnetic tubes which surface and appear as active areas or filaments. The filaments seem to have a circular cross section otherwise their observable diameter would change. The whole movie from which this picture is taken shows the motion of matter in the loops, the hydrogen alpha light shows a recombination of protons, therefore, these filaments are produced by positively charged matter in motion. The positively charged and therefore active masses emit themselves. Immediately after the start, the filaments are formed via attraction among positive currents and their diameter become smaller than that of the active area. Their cross section is circular. The surfaced positive matter emits itself simply by electrostatic repulsion. The positive matter has its origin in the solar core; see below at the origin of the positive matter. Fig. 3 shows the Sun in the light of iron ions. Active areas of larger diameter - in white color - emit fine filaments of much smaller diameter. Also the diameters of the beautiful loops are almost the same. These diameters have almost the same value along the loop (Klimchuk 1997,1999). Fig. 3 Many filaments of the Sun shown by EIT of SOHO. Round active areas (white) emit thin filaments (blue) which become thicker when the velocity of this emission is braked by gravity. Lower velocity of the same positively charged matter means lower electric current, therefore, lower attraction among the parallel currents and, therefore, higher diameter. Note that the footpoints of these loops are in northern-southern direction which cannot be explained by a hypothetic solar dynamo. This mysterious dynamo is allegedly driven by the differential rotation which, as well known, has an eastern-western direction. The filaments of superclusters were shown in Fig. 1 . No active areas emit these filaments, but their form is made also via motion of electric charges as will be shown below. 3.0 What is the cause of the accelerated expansion of the Universe ? The answer was already looked for by more authors of this symposium, shown in the reference. In this paper, a model will be suggested which seems toexplain not only the accelerated motion, but also the filament-form of the superclusters and the strong X ray emission from the cluster-gas. The common answer is: all these three recent observations are cosistent with the production of the electric charge in the HRD-stars (Fig. 4 below). Fig. 4 Separation of the positive and negative electric charges by temperature difference (by thermoelement-effect). Non-electric astronomy supposes that stars contain everywhere exactly 50-50% of electric charges (above). Electric astronomy takes into account that the electrons (black dots) have at least 1836 times smaller mass than the positive particles, therefore, they explode in the transparent hydrogen layer (below 13 000K). This continual electric explosion is the solar wind. Cosmology was relatively easy to understand before 1998 February when the recent measurements of the I a supernovae were not known (Perlmutter 1998 ). One galaxy from the 16 000 ones - shown in Fig. 1 - attracted the other galaxies and therefore the velocities of all galaxies were continually lower. Most likely, these velocities will be reduced to zero by the uninterruptedly acting gravity and, then, all galaxies will start the Big Chrunch. We had a simple Universe - a forever-oscillating one - in our mind. Nobody looked for a "vacuum energy" or for a "dark energy" which would reduce the expansion-velocity ! Just a force, the gravity, was enough. It was not mentioned due its evidence, but this gravity-model had an important advantage: the braking-force of a certain galaxy had its anti-force based in the other galaxies ! But now, the new ad-hoc-models do not seem to obey the third Newton-law. Even, if a vacuum-energy existed and could be transformed to an accelerating force, the vacuum cannot be used as source of an anti-force. It has no mass. No acceleration-force of a galaxy ( mysterious or clear) is possible without a clear anti-force. If the galaxies would be charged e.g. positively and the caused electric repulsion force would be e.g. 10% stronger than the gravity, the accelerated expansion caused by the electric repulsion would remain forever due to the fact that the electric force has an infinite range and the same formula related to that of gravity. This model would obey the third Newton-law because the electric force would push one galaxy in one direction and all other galaxies in the opposite direction. We will see that the "hot" halos of the galaxies and clusters are charged positively, however, not the stars of the galaxies. But, is it possible that the accelerated expansion of the Universe is a simple result of the accelerated expansion of space ? Naturally, physicists were often unsure about the nature and expansion of space. Also Einstein was unsure. But this idea of the accelerated expansion of the Universe by accelerated expansion of space did not emerge before 1998 February, therefore it seems to be an ad hoc idea. Moreover, this idea only prolongs the answer, because the next question will be: Why does space expand faster and faster? Even if it would be so, the Universe contains many accelerated expansions in which a force overbalances gravity. Prominences, jets, planetary nebulae, lobes of radiogalaxies expand in very different scales which cannot be valid for the accelerated expansion of the Universe. These expansions of much smaller and various scale cannot be explained by the accelerated expansion of space ! 1 000 km/s in 1996 Jan. 15. No cause in the supposed expansion of space seems to explain both motions ejected by the same body. On the other side, the electric force can explain all these antigravitational motions, which is 10^36 times stronger than gravity. 4.0 What is the origin of separated electric charges in the Universe ? One origin is well known: all bodies in the Universe are hit by strong photons and particles of the cosmic rays. Especially the clouds from which stars are born have a high surface which is hit by strong ultraviolett photons of young stars in the proximity. Most of the ejected electrons return to the cloud, but a small fraction of electrons leave the cloud forever due to the electrostatic escape velocity. H II clouds in quick expansion come into existence. Neutral clouds i.e. H I -clouds will be ionized to H II clouds. Also protons are ejected by the same particles, but their mass is 1836 times higher than that of the electrons, therefore their ejection is negligible. Therefore, negative clouds i.e. "H 0"-clouds do not exist. Nature has an asymmetry in this case. Stable positive ions exist but stable negative ions do not exist. Another process of the separation of the electric charges is stronger but less known: the emission of the stellar wind (Birkeland 1896, Biermann 1950s, Koertvelyessy 1998). The stellar wind is known as a continually ejected and charged mass. But what is the cause of this ejection and the charge ? Is this charge positive or negative ? This question seems to have its very first answer in Fig.5. The big temperature difference between the stellar core and the surface moves the electrons and other light particles outwards. The electrons have a 43 times higher velocity in a given temperature related to that of the protons of the same temperature, therefore, the core will be positively and the surface negatively charged. The electrostatic repulsion in the core does not produce an explosion due to the non-transparent plasma in the core. Otherwise, already 0.001 g protons in overbalance - which means only 100 Coulomb more solar positive charge than negative charge ! - could inhibit the formation of the Sun. Also the electrons in overbalance in the stellar body are ineffective as long as they wander in the plasma. But arriving the transparent hydrogen layer - which has a temperature below about 13 000 K in the Sun - the electrostatic repulsion among the electrons produces a continual explosion which emits light matter into space. The cause of this process is constant: the temperature difference, which is 15 MK in the Sun. Therefore, the solar wind is constant in velocity (750 km/s see Ulysses). This wind is isotrop: 10 A from each square kilometer on the Sun´s surface. The negative solar wind does not attract electrons, therefore the wind-emitting solar surface - the so called coronal hole - seems to be black in X ray. Small coronal holes emit wind of the same velocity of 750 km/s as the large coronal holes. According to this model, all HRD-stars separate the positive charged particles - which are cumulated in the core - from the electrons - which are emitted as stellar wind. Supposed core-explosions (Amabartsumian 1957, Grandpierre 1996) transport fragments of the positive core onto the surface. The positive charge emerging from the depth to the solar surface is easy to distinguish from that of the wind. It is not constant, not isotrop and it attracts electrons, therefore it has a recombination light i.e. hydrogen alpha-, UV-, EUV-, X ray-light - but no infrared ! Due to the high concentrations, the emitted positively charged matter forms solar loops (Fig. 3 Koertvelyessy 1999) or radial filaments ( Fig. 6). The loops and other emissions of the corona are, therefore, not 1-2 MK hot but positively charged. The socalled "corona problem" can be solved by the recognition of the electric charges in the Universe and not monthly by new and newer models on the basis of a neutral Universe (e.g. picoflares, cold- flares, magnetic carpets; see NASA press releases in 1999). But there is a new and much greater corona problem: the halo of the galaxies and clusters is filled with allegedly 30-300 MK hot gas. But this not a hot gas- which would be cold in picoseconds by heat-radiation into the empty space - but it is a positively charged gas which produces the accelerated expansion of the Universe. It is the "cemetary" of the stars. It has now an atomized mass which is four times higher than that of the living stars. This will be shown below in detail. as anodes and as quick rotated positive charge producing up to 1000 Tesla. II The neutrons stars show similar properties but amplified : 10^25 Volt and 60 GT. Many interesting measurements show that the clustergases have strong X ray emission and a big mass. The first explanation of a mysterious very high temperature of 30-300 MK of unknown origin will be corrected below. The development of the stars should be corrected using the laws of physics. Three of them: solidus, liquidus and gaseous states of matter are known since millennia. This paper shows that the fourth (plasma-) state of matter is not clear, however. Plasma should cause not only the understood presssure in the stars but also the ejection, form, energy of filaments. However, nobody understands that the strongest jets are ejected at gravity of the heaviest black holes. Attraction cannot cause repulsion. The solution is the introduction of a new concept: the fifth state of matter. This shows the electric origin, form, energy of the solar and almost all filaments and jets. Bodies in the plasma state of matter consist of particles which move thermally i.e. in zigzag. Therefore, the thermal laws of phyisics are valid. However, bodies in this fifth state of matter e.g. as the solar corona consist of particles which move non-thermally i.e. parallel to each other. Therefore the thermal laws of physics are not valid. For example the solar corona radiates no heat only cold light like fluorescent lamps. Its iron ions are made electrically, not thermally. In Bose-Einstein Condensate matter has almost zero energy. This state of matter should get the name: zeroth state of matter instead of “fifth state of matter”..
Dr. László Körtvélyessy wrote: The attractive and repulsive forces in microcosm and macrocosm show the elegant simplicity and beautiful symmetry of the Universe. 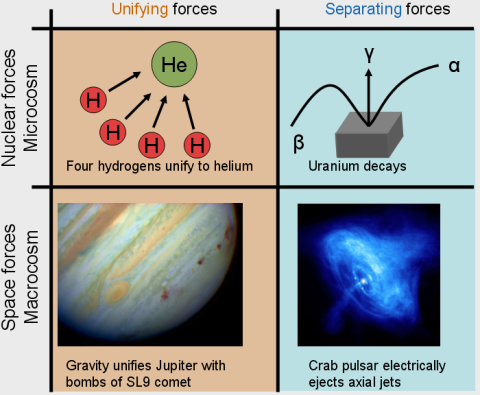 One force which unifies matter in atoms or the universe- gravity, and another force which separates matter - electric. That is, by definition, the Unified Field - just substituting electric for charge. Cr6, We agree - the model is all important. The main problem for the classicists - if I may be so bold - is proper identification of charge, positive and negative, such as with anodic or cathodic electric sources, to account for current flows. Just like EU guys needing to form DLs to account for charge flow. Most everyone, including Dr. K, have been doing dance steps or sleight-of-hand in order to validate their ideas. It's to be expected. You've been very patient with your concern. I'ts taken me a while to get here. Translating his work shouldn't be difficult. Go ahead and try. I'd help. I'm getting plenty of things to do, which is a blessing, thank you. I keep thinking about particle/matter distribution and flows at the Earth's poles - vorticies! Or Windhexe! Nudge, nudge, wink, wink. I have a "gut" feeling that translating parts of his work into a Mathis' style Charge Field framework could really be interesting. To be honest, the details/math might be beyond my humble abilities but I do see the "logic" behind it. Dr. K always called the Sun a "thermo-element" that just radiates. I see it as a Charge engine. There must be an essential charge field radiating out of Dr. K's thermo-element. The solar wind is the result of the asymmetric thermal motion of the electrons in the Sun. An electron would fly in all direction with the same velocity in an isothermal Sun. However, the Sun is colder outwards. A random flight outwards brings an electron in a colder proximity (i.e. its velocity becomes lower). Therefore, the return into the original position is improbable i.e. all electrons drift slowly outwards. Naturally this drift is very small, but it has enormous cross section in the whole Sun. These electrons appear at the photosphere and their mutual electrostatic repulsion emits them. A huge and continual negative current as solar wind flows into the space. Does the Sun have enough electrons to continually emit them without getting new electrons? The Sun does not lose all of its 1057 electrons via solar wind. It loses only about 10 electrons daily. This is not too much even in a long solar life of 1010 years. The Sun will lose at the end 4 x 1051 : 1057 part of its electrons i.e. only 0.0004% of its electrons. The Sun is in fact an irreversible current-source but even for gigayears. The protons are 43-times slower due to their 1836 times higher mass and mostly remain in the core. Always the quickest electrons are lost for the solar core, this process cools the core but all solar activities mainly have their electric energy from this separation of the electric charges via this so called thermoelement-effect. Other effects amplify this charge separation, for example the neutrinos from the solar core push the electrons outwards, never inwards. Moreover, solar photons push the electrons stronger outwards than inwards. This presentation on "The Sun is not Gaseous" (15 minutes) from the thunderbolts site is worth a second look in terms of Miles and Dr. K's theories on the SOHO findings...particularly as it pertains to gravity. Dr. K mentions that the filaments (non-cycling photons in terms of Miles?) and plasmas are not affected by gravity. He points to mass with CMEs as a problem for the classical model. The Sun is not Gaseous -- Critical 15 minutes of Solar Physics: Dr. Pierre Marie Robitaille. The surfaced electrons continually explode electrically in the photosphere as the solar wind. It never stops. The emerging electrons have a free space upwards. They are not cumulated. Their very high velocity of typically 750km/s would need 24million Kelvin to be emitted thermally! But the solar surface is only 6000K hot. Therefore, the solar wind can only be an electrostatic continual emission. The electron concentration in the photosphere is constant because the thermoelement-effect only depends on the temperature-difference between core and surface and this is constant 15MK. All electrons which drift into the photosphere will be exploded. The satellites measure a constant wind-velocity of 750km/s in solar minimum. Ulysses shows a sine-curve of the wind-velocity between solar minimum and maximum because one side of the Sun is more negative and the other hemisphere less negative. The rotation of the Sun of 28 days is clearly seen in this sine-curve. When the Sun is in minimum activity, the whole solar surface is negative and emits the solar wind. The negative photosphere does not attract e.g. thermal electrons, it pushes electrons. The solar wind mainly contains of electrons and some swept away protons and other light ions. These all have the same 750km/s velocity. Related to the protons, the oxygen ions do not have a 4 times lower velocity according to their 16 times higher mass (as they do in the depth of the Sun in a hot thermal equilibrium). This measurement shows that the ejection of the solar wind is a non-thermal (electric) process in which the velocity of all particles is equal. In thermal processes is the energy of all particles is equal. Therefore, the solar wind is no plasma! It is a non-thermal (filamentary) body (it is in a fifth state of matter i.e. the electrons fly parallel to the filament-axis and not in zigzag). The wind-filaments are clearly detected by satellites; e.g. Ulysses crosses these wind-filaments. The wind-electrons became visible in the aurora. The observation clearly shows that the filaments of the negative wind excitedly "dance" in the aurora when the positive eruptions of the Sun are frequent. The Sun is a hot body, and its electrically neutral evaporation was often stated to emit the solar wind thermally. But this mass would fall back onto the Sun via strong solar gravity. Neutral particles can escape the Sun only with a higher velocity than 618km/s.The "solar wind" which would be emitted from the "2MK hot corona" (Parker) had a much higher evaporation-velocity of 220km/s but this is still too low. SOHO showed that the solar wind exists already in the altitude of 7000km i.e. deep below the corona. The wind has here a velocity of only 10 km/s i.e. too low to escape. The other problems of the Parker wind model are the area, the form and the time of the emission. The wind starts from the UV-black coronal holes but the corona starts from the UV-bright footpoints - these are quite different. The solar wind is filamentary, but neutral hot emissions would be formless clouds. If the corona would evaporate the solar wind, no wind would exist when no corona exists on the Sun. But oppositely, the solar wind is the strongest with its highest velocity of 750km/s when no corona exists on the Sun. And vice versa: When the corona appears in maximum, the velocity of the wind falls immediately, moreover, this velocity falls down to 300km/s during solar maximum. Already a small footpoint clearly lowers the wind-velocity. The solar wind is not identical to the solar eruptions which appear 11 yearly in solar maximum and which have their positive charge from the solar core! Obviously, the negative solar wind cannot be emitted from positive (active) areas or from their UV-active positive filaments. Great description of the solar wind. The universe is far more interesting than mainstream science has ever 'explained'. I've come to believe that the charge field allows many additional possibilities. As always, I have complete respect for the works of Dr. K and Dr. Robitaille. I would try to understand them better if I wasn't so mission bound single-minded most of the time. On the other hand, I must admit, when I think about it, I haven't considered the sun as a ball of gas or plasma in years. Sure, Helios' sky is a dense carpet of solar filaments reaching thousands of kilometers up into space, above which, the solar wind is filled with emitted and returning charge. I'm certain the sun has a surface, a single ocean of liquid iron. The constant energy emissions result in storms that involve huge charge exchanges. I'll re-read the description a few more times to be sure. Thanks for helping me develop these ideas.